In America’s Pacific Northwest, communities are taking part in a historical opposition to Big Coal and its reckless pursuit of profits. American demand for coal is declining, and as a result the American coal industry plans to extract billions of tons of coal from the Powder River Basin and ship it to rapidly expanding Asian markets via proposed deepwater ports in Washington and Oregon. 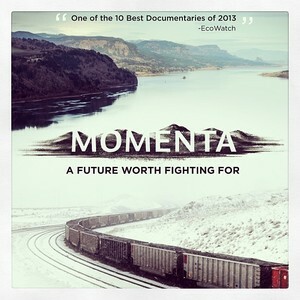 Momenta is an environmental conservation film that serves as a call to action, aiming to motivate communities in the Pacific Northwest to fight against the coal export industry. The filmmakers and interview subjects ask the audience to rethink fossil fuels and the inevitable long-term damage they will cause to the global environment. As coal profits in Montana and Wyoming’s Powder River Basin decline, companies are looking to export their product to Asia via the communities of the Pacific Northwest. This area offers a gateway to transport coal to Asia to be burned as fuel, and there are proposals to open more ports to enable a greater output. These plans would double the number of mile-and-a-half long trains that cross the region each day, likely spreading toxic coal dust in their wake. Experts explain that coal is accountable for less than 30% of the world’s energy supply, yet over 40% of the world’s energy emissions. The film cites data showing the greenhouse gasses from exporting and burning the remaining coal in the Powder River Basin would be massive compared to those of the Keystone XL pipeline, and would push CO2 emissions well beyond the tipping point of global devastation. Momenta utilizes beautiful cinematography to capture the lush and vibrant landscapes of the Pacific Northwest, making the anti-coal argument even more compelling by showing the purity of nature that we all risk losing.